Current Weather is compatible with Windows 10, 7 and XP. It has been reported to work on Windows 8 and Vista. The current weather condition is visualized in the system tray. Provides the actual weather condition for over 4000 locations worldwide. Alert message upon weather changes (configurable). Provides detailed weather information up to 5 favorite locations simultaneously. 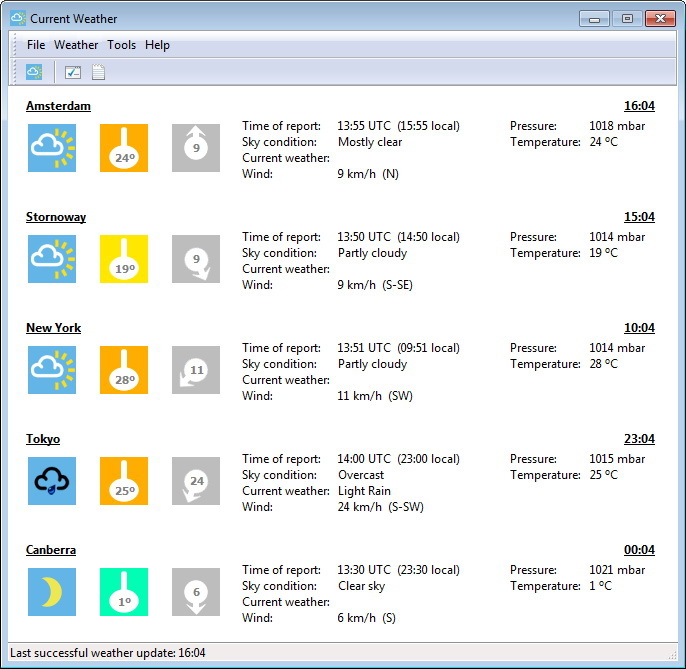 View weather information per location in a tabbed view or all together in one view. Customize Current Weather to your regional settings. Enhanced option settings to adapt Current Weather to your needs. Easy to use interface with clear symbols. Uses few computer resources such as memory and hard disk space. Consult the Current Weather help file for an extensive description and more screenshots.